Nigel Mansell claimed his maiden F1 victory in front of an ecstatic Brands Hatch crowd but Alain Prost, courtesy of the three points he gained from finishing fourth, became the first Frenchman to secure the drivers' championship. That Prost claimed the crown with two round of the season to go was in part thanks to the falling away of early championship leader Michele Alboreto who failed to score a single point in the last five races. Prost was the deserved victor but better reliability from Ferrari would have made for a tighter finale. Ayrton Senna, who but for reliability issues with his Lotus would have been pushing Prost hard, set a new lap record in qualifying and in so doing earned himself 100 bottles of champagne. Mansell, meanwhile, struggled in his Williams. "If I can only get a clear lap tomorrow then we'll be in business," he said. He was proved right. Prost, needing only two more points than Alboreto to take the title, was doing what he did best - taking no risks as he qualified on the third row as the Ferraris both started way back down the field. Senna led the race from Keke Rosberg with Mansell having been squeezed off the road at the second corner, but crucially Prost had been forced onto the grass to avoid the slow-starting Finn and found himself back in 14th. Rosberg snapped at Senna's heels for seven laps but was thwarted by defensive driving which verged on obstructive. Eventually he clipped the Lotus as he tried to pass and as he spun he hit the Brabham of Nelson Piquet which was forced to retire. After being forced to pit to replace a tyre, Rosberg emerged a lap behind Senna and Mansell at the front. 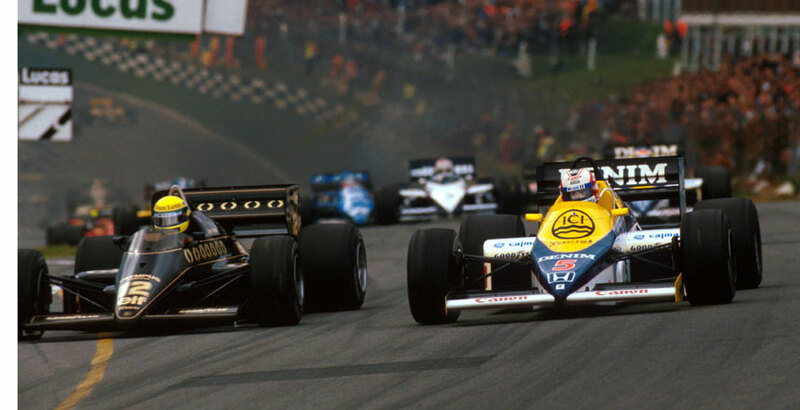 Mansell seized his chance as Senna was momentarily checked by the slower Rosberg and swept into the lead. He was never again headed. Alboreto was fighting a losing battle to catch Prost - he had been passed by him on the ninth lap - in his Ferrari and his futile efforts ended when his car caught fire on the 27th lap. Needing only to finish fifth or better, Prost drove solidly and conservatively to achieve just that. But all eyes were at the front where Mansell crossed the line to wild celebrations from the 75,000-strong crowd. "It's the best day of my life," he grinned. "My team would not tell me how many laps to go in case I got too excited." John Watson, back in a McLaren in place of the injured Niki Lauda, finished seventh in what turned out to be his final F1 outing. There was one dampener on the day when it emerged that a British driver, Stephen Langton, had died in hospital after being run over in an historic car support race when he was thrown clear of his Connaught.